People often assume reporters have actual expertise in the stories they cover. Some actually do. Jim Galloway is a genuine expert on state government and politics. But I’ve learned to tread lightly when called to represent myself as an expert on pretty much anything. When Occupy Atlanta became a “thing,” I paid enough visits to the encampment to have developed more insight to the story than, say, those who watched the story unfold on TV. It turned out my insight was very limited, though. When Mayor Kasim Reed announced that he was rescinding the Executive Order that allowed Occupy Atlanta to stay overnight in Woodruff Park, he said he would lift the order “at a time of my choosing.” He said he would try to negotiate the group’s withdrawal from Woodruff Park via a group of clergy. This led me to casually predict that Reed was “in no hurry” to call in the cops to forcibly evict Occupy. My prediction was based on my belief that Reed didn’t want to show a heavy hand against folks with whom he largely shared a leftist political outlook. Specifically, I’d heard Reed complain weeks earlier about corporate America’s failure to create jobs while turning record profits — more or less the exact complaint of Occupy Atlanta. Shows what I know. Reed ordered Occupy Atlanta’s eviction less than 48 hours later. The day after Reed’s announcement, I produced a story about Reed’s upcoming decision. 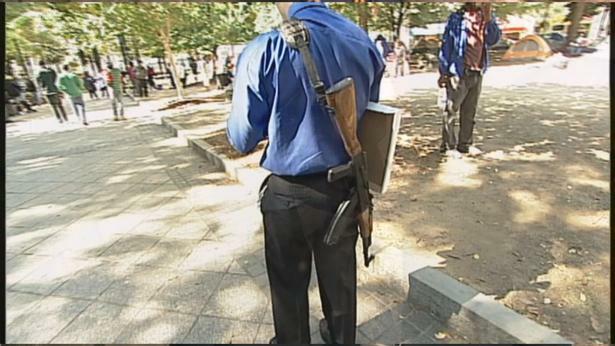 While I was in the park, another 11Alive crew told me they’d seen a guy walking around the park with an assault rifle. The weapon was a semi-automatic knockoff of an AK-47. My thought was: This is Georgia, where politicians brag about their arsenals. Ain’t nothing special about toting a big ol’ gun in public. Reed specifically cited the presence of the weapon as his rationale for barricading Woodruff Park that day, then sending in the cops early the following morning. Fortunately, nobody remembered me speculating about the timing of the dispersal of Occupy. Or if they did, they were too polite to bring it up. If I cover a murder trial, somebody will invariably ask me what the verdict will be. I’ve been wrong so frequently that I won’t do it anymore. I don’t mind somebody touting me as an “expert,” if you’re merely comparing me to somebody who has no first-hand knowledge of a news event. But the truth is: I’m only expert at putting facts together, and weaving them into a storyline on deadline. That only makes me a TV reporter. This entry was posted in WXIA on October 31, 2011 by live apt fire. Ah, you give yourself too little credit. The real shame would be failing to realize the limitation that applies to us all, that we don’t and can’t know the future, especially when predicting human behavior. “Only two things are infinite,” Einstein said. “The universe and human stupidity, and I’m not sure about the universe.” What I’d really like to know: was the gun-toting nutjob really an OWS supporter or anti-OWS and looking to hasten the eviction? The gun totin “nutjob” saved the taxpayers money by hastening the eviction process indeed. Just wished that he showed up sooner in order to spare taxpayers those monies as well. Maybe the guntoter is on to something. Yeah Sam, you’re right. Guns and the threats they bring have done so much for honest and open discourse. Or are you merely interested in forcing your way upon everyone else? I’m interested in the reduction of waste when it comes to taxpayers dollars. BTW, while it was not at all smart for the gun toter to bring his weapon to such a setting, it should be noted that he was not violating any law, but your “honest and open discourse” individuals were (they were arrested for it in the event that you want to argue that point as well). I’m not forcing anything on anyone but my two cents worth and my right to say it. He was actually a moderate in the State Senate and carefully crafted legislation with his Republican colleagues. Some would call him a Statesman while other a Sellout. Anyway, the extreme left have always been wary of him, ie, Vincent Fort, but for them he was a better choice than Norwood. The Occupiers should have known all along how this was going to go down.